The Digital Youth Divas program has evolved through a 3-year design-based research effort, building on previous work by the Digital Youth Network. A new key idea was using narrative stories to engage girls in STEM activities to support STEM-linked knowledge, interest, and identity development. Our research agenda sought to look at changes in domain-specific interest, knowledge, and identity for participating girls, identify patterns of participation in the face-to-face and online spaces, and explore the role of narratives in the project, especially as related to girls’ developing STEM identities. Pinkard, N., Erete, S., Martin, C.K., McKinney DeRoyston, M. (2017). Digital Youth Divas: Exploring Narrative-Driven Curriculum to Spark Middle School Girls’ Interest in Computational Activities. Journal of the Learning Sciences Special Issue: Designing Learning Environments for Disciplinary Identification. Erete, S., Pinkard, N., Martin, C. K., & Sandherr, J. (2016, August). Exploring the use of interactive narratives to engage inner-city girls in computational activities. In Proceedings of Research on Equity and Sustained Participation in Engineering, Computing, and Technology (RESPECT), 2016 (pp. 1-4). IEEE. Nacu, D. C., Martin, C. K., Pinkard, N., Hamid, T., Li, T., Raicu, D. S., & Gemmell, J. (2016, August). Helping educators leverage youth interest in STEM out-of-school programs. In Proceedings of Research on Equity and Sustained Participation in Engineering, Computing, and Technology (RESPECT), 2016 (pp. 1-1). IEEE. Martin, C. K., Pinkard, N., Erete, S., & Sandherr, J. (2016). Connections at the Family Level: Supporting Parents and Caring Adults to Engage Youth in Learning about Computers and Technology. In Y. A. Rankin & J.O. Thomas (Eds.) Moving Students of Color from Consumers to Producers of Technology. Hershey, PA: IGI Global, 220-245. Erete, S., Martin, C.K., & Pinkard, N. (2016). 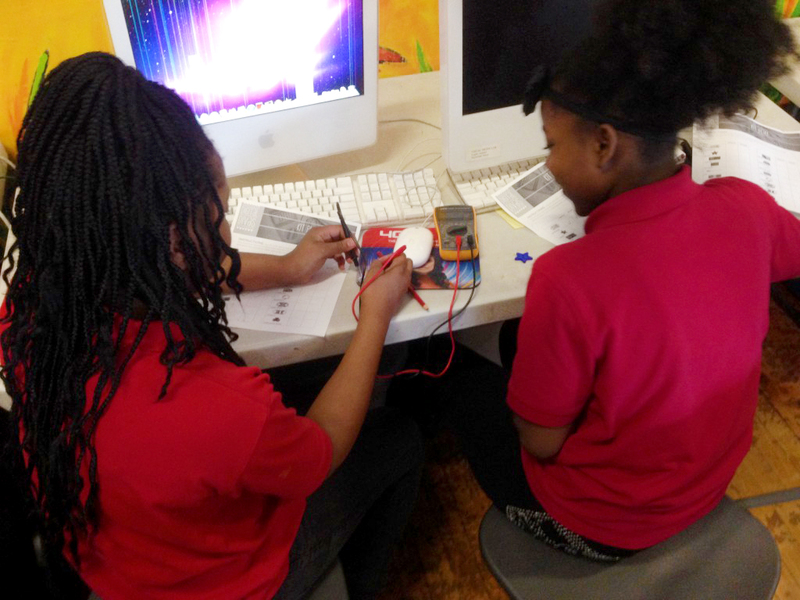 Digital Youth Divas: A Program Model for Increasing Knowledge, Confidence, and Perceptions of Fit in STEM amongst Black and Brown Middle School Girls. In Y. A. Rankin & J.O. Thomas (Eds.) Moving Students of Color from Consumers to Producers of Technology. Hershey, PA: IGI Global, 152-173. Martin, C.K., Erete, S., Pinkard, N. Developing Focused Recruitment Strategies to Engage Youth in Informal Opportunities. In Proceedings of the 1st Annual Research on Equity and Sustained Participation in Engineering, Computing, and Technology (RESPECT) conference, Charlotte, NC, August 14-15, 2015. Erete, S., Pinkard, N., Martin, C., Sandherr, J. Employing Narratives to Trigger Interest in Computational Activities with Inner-city Girls. Proceedings of the First Annual Research on Equity and Sustained Participation in Engineering, Computing, and Technology (RESPECT) conference, Charlotte, NC, August 14-15, 2015. Erete, S., Pinkard, N. & Martin, C., & Dickinson, J. (2018). Towards an Ecological Approach to Measuring STEM Identity Shifts Amongst Non-Dominant Girls. In session entitled, Measuring Making: Methods, Tools, and Strategies for Capturing Learning, Participation, and Engagement in Maker Activities. AERA, NYC (April 2018). Roberson, A. & Moore, S. (2017, November). Exploring circuits through constructing eCards. Workshop session at the 8th annual STEM Summit: Building Capacity and Partnerships for STEM Education. Organized by Northwestern University Office of Community Education Partnerships. Roberson, A. (2017, October). Digital Youth Divas. In Y. Kafai, K. Peppler, L. Buechley (organizers) Textile Messages: Electronic Textiles as Disruptive Designs and Inclusive Activities Symposium. Symposium at the Digital Media and Learning Conference (DML), Irvine, CA. Martin, C.K. (2017, October). Micro-level analysis: Digital Youth Divas Caring Adult Network. In T. Everett, N. Pinkard, Martin, C.K., S. Madison-Boyd (organizers) Community initiatives and technical platforms to understand and address equitable learning in Chicago. Symposium at the Digital Media and Learning Conference (DML), Irvine, CA. Roberson, A. and Pinkard, N. (2017). Digital Youth Divas e-Paper. Active Learning Breakout Session at the Presidential Awards for Excellence in Mathematics and Science Teaching (PAEMST). Washington, DC, October, 2017. Pinkard, N., Erete, S., Martin, C.K. (2017, April). Equitable Approaches: Computational Thinking Through Design. Part of a symposium Stories From the Field: Integrating Computational Thinking Across Curricular Domains at American Educational Research Association (AERA) Conference, 2017 (San Antonio, TX). Martin, C.K., Pinkard, N., Sandherr, J. (2016). Making a Difference: Design strategies to engage underrepresented communities in maker spaces. Digital Media and Learning conference, Irvine, CA, June 3-5, 2016. Martin, C.K., Erete, S., Pinkard, N., Roberson, A. (2016). Generating Alternative Stories: Using fictional narratives to build STEM identity, interest, and community for non-dominant girls. Digital Media and Learning conference, Irvine, CA, June 3-5, 2016. Martin, C.K., Pinkard, N., Lang, C. (2016). Learning Analytics in Informal Spaces. Pre conference workshop at Digital Media and Learning conference, Irvine, CA, June 3, 2016. Martin, C.K., Nacu, D., Pinkard, N., Erete, S. (2016). Supporting self-directed learning and identity development in online communities. Poster at the CIRCL Cyberlearning 2016 meeting, Washington, DC, June 2016. Martin, C.K., Sandherr, J., Boytor, E., Nacu, D., Pinkard, N., Erete, S. (April 2016). Brokering in Blended Environments: Designing to Support Learning On- and Off-Line In Nacu, D. and VanHorne, K. symposium Brokering Future Learning Opportunities: Theoretical and Practical Considerations for Linking Youth to Out-of-School Time Opportunities at AERA Conference, Washington, DC. Martin, C.K. (2015). Does making matter, and how can we tell? Presentation at the Maker Educator Institute, Pittsburgh Children’s Museum, Pittsburgh, PA, October 9, 2015. Martin, C.K., Nacu, D., Pinkard, N., Acholonu, U. (2014). Using a networked community to support equitable access to computational learning: The Digital Divas. SIG-Learning Sciences Poster Session at American Educational Research Association Conference, Chicago, IL, April 16-20, 2015.